With the Nottingham Open and Wimbledon coming up, I decided to have a look to see if there were any local tennis clubs in the area. 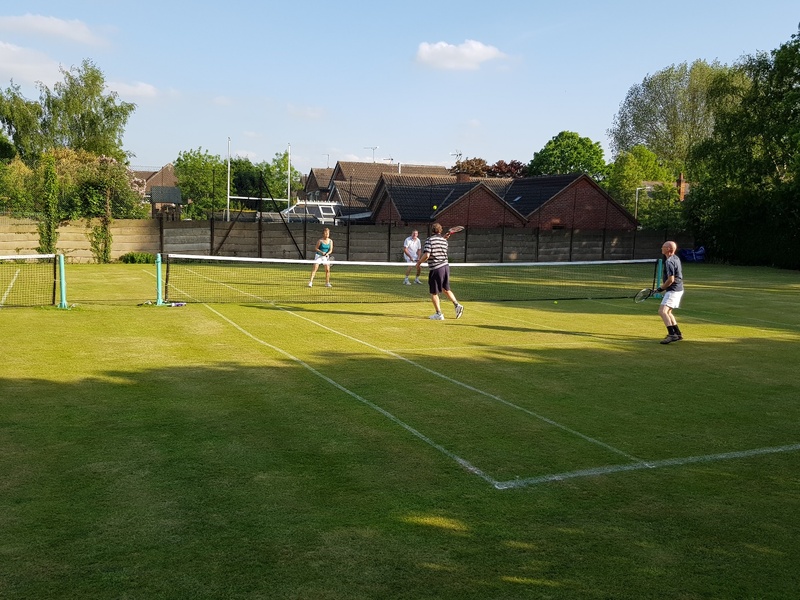 I came across Chilwell Tennis Club, hidden away behind the Chilwell Memorial Hall, it may seem that they are only for an exclusive group of people, but I realised straight away that they were desperate for this to not be the case. “I found out about this place a few years ago,” said Chris Clift, Secretary of the tennis club at Chilwell Memorial Hall. “I’ve always wanted see what was going on behind the hall and I noticed that they were playing tennis. I met with Colin Bradford, a great tennis player and long-standing member and I’ve been here ever since. “You could say that we are, unintentionally, the best kept secret in Chilwell and Beeston, because people don’t even know that we’re here. Part of my job is to raise our profile because we do need more members. “The first piece of advice we took on board was to get in touch with the local school, to see if they would be interested in using this for coaching and they said yes. The work that Chris has put into the club has seen him pick up an award for his efforts, although he insists that the award is for the efforts of everyone at the club. “I was very proud to receive an award on behalf of the club. 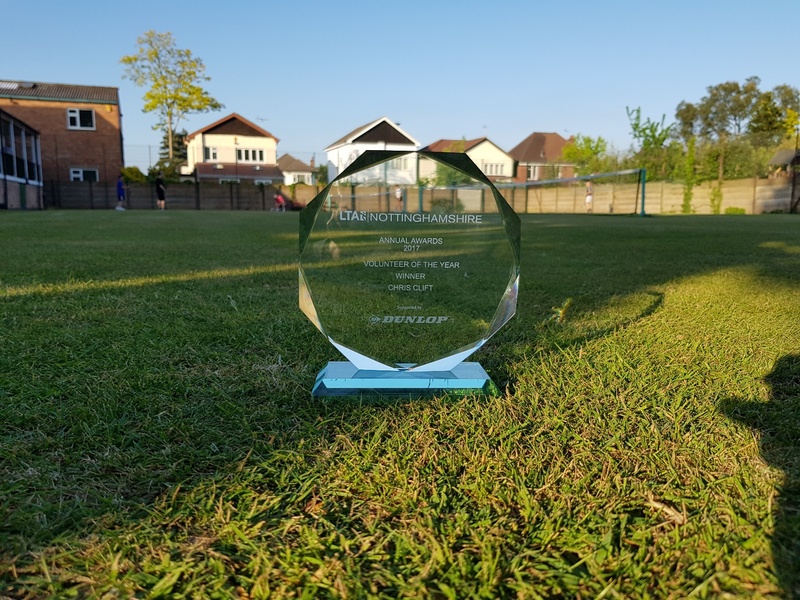 “The Nottinghamshire LTA (Lawn Tennis Association) asked everyone to nominate people in various categories and one of the categories was volunteer of the year. “Unknown to me, the sports development officer for Nottingham at the time put my name forward and it was a total shock when I got the phone call saying that I’ve been nominated and that I’ve won it. Another hard-working volunteer at the club, is treasurer Pete Whitehouse who has been involved at the club for a decade in which there have been some tough times. “We have a policy where if we get less than 20 members in one year then we are supposed to close. One year when it was really bad, we had 21 members. Oliver Adams, 24, has only recently joined the club, but he enjoys the chance to play tennis and meet new people. “I casually play tennis with my brother, but I enjoy playing at a club because it’s more structed, and you get to meet new people. Bridget Scott is in her 60s and has been living in Chilwell for the past two years, and like Oliver she enjoys the social benefits of playing at the club. “I’ve been playing since I was 15, I never played matches though. I prefer the social side of things. Tennis is not the only activity available at the Chilwell Memorial Hall. Regular activities include dance classes for all ages and styles, Zumba and line dancing, fitness classes, as well as indoor bowls, table tennis and badminton. There is also a snooker table for those interested in snooker. All new club members can get a 25% discount by quoting ‘Beestonian’. This weekend the ABC Art Trail takes place in venues across Beeston, Attenborough and Chilwell, showcasing the work of 26 artists who live locally. The ABC Arts trail is exactly what it sounds like. It’s a trail of artistic works by creative people who are all part of our community and living in Beeston, Attenborough and Chilwell. This year there are 26 artists taking place, with their work being displayed in 11 venues. They include painters, textile artists, a potter, glass artists and jewellery designers. This is a great chance to discover new artists and see for yourself the amount of creativity that this town and surrounding area can hold. The trail is free to take part in, and will be happening across Saturday 2nd and Sunday 3rd of June, starting at 11am through to 6pm on both days. They’ve got a map pinpointing all the venue locations, which can be visited in any order, so you can plan the route that works best for you. Find the map here. They include places like independent studios, houses, local schools and shops. Specific venues taking part are Beeston Dental Practice, Red Lion Pottery and Meadow Lane Infant School. The participating artists will be present at each venue with examples of their work available to purchase. So as well as discovering more art, you might end up going home with some! Our Editor-in-Chief, Matt Turpin, will be taking part in the trial and visiting each venue, where he will be collecting pieces of artwork. These pieces will be individual letters made from a variety of art forms, and once put together they will spell ‘ABC ART TRAIL’ (11 letters for the 11 venues). This event is yet another example of why Beeston and the surrounding areas are such hubs of creativity. It’s also a way for people to show their support not only for the artists themselves but for the community as a whole. We’re all about supporting local businesses, but this is a way to appreciate individuals in their creative endeavours. The ABC Art Trail itself is supported by businesses such as: The White Lion (where they have their meetings), Yarn, Charlie Foggs, Artworks and Cycle Inn, to name a few. Plenty of their work features the local area, such as paintings of well-known places, meaning that their art is truly personal, both from their perspective as artist, and the people who support them by buying their work or enquiring about commissions. You can also like them on Facebook @abcarttrail, and register your attendance via their event page. Beeston’s own intrepid historian and occasional paranormal explorer, Alan Dance, tells us about some spooky goings-on on one of Chilwell’s most infamously-named streets…. If you follow the tram lines west of Bramcote Lane, you will shortly cross Ghost House Lane. If you’ve ever wondered how it got its name, it’s because at the bottom of the lane, there once stood an old cottage called the Ash Flat House. Almost 200 years ago the house became the centre of some very strange goings-on, such that many people believed it to be haunted, and thereafter it became known as the Ghost House. Not only was the house alleged to be haunted, but it was also believed that a murder had been committed there. But beyond these few brief facts, little more in the way of detail was recorded, and such written accounts as existed were rather sketchy. This area was farmland, but in the late 1940s building work began on the Inham Nook housing estate, and the Ghost House was demolished in 1952 as the estate grew. As a child, I was always intrigued by this story of a haunted house and an unsolved murder, but when I tried to find out more details – who was involved, who was murdered and why; who was the murderer, was he ever caught and tried; and when exactly did these events happen, if they really did happen – nobody seemed to know. So, in 1996, I set out to see what I could discover. After considerable research in old newspapers, parish registers, census returns, wills and other documents in the Nottingham Archives Office and Library, I was able to piece together a fascinating account which shed light on events which took place all those years ago, culminating in the publication in 1998 of my book The Chilwell Ghost – a New Investigation. A newspaper report from 1850 stated that John Baguley had just died at Chilwell, confessing on his deathbed that about a quarter of a century earlier he had murdered a pedlar for his money and possessions, and buried the body. Armed with this one name and date, I was able to uncover much more evidence. This showed that the Baguley family lived at the Ash Flat House, owned by local landowner John Pearson, for whom Baguley worked. A pedlar, who regularly visited the area, had indeed gone missing in late 1827 and was never seen again. Witnesses said he intended to spend the night at the Ash Flat House and it was rumoured he was rather friendly with the family’s eldest daughter, Diana. They were a family with a poor reputation in the village. Diana had produced three illegitimate children and in 1837, along with her sister Jane, was imprisoned for theft from two Nottingham shops. Baguley and his family were then evicted by Mr Pearson, and another family moved in. It was this family who first reported the strange happenings. They refused to stay in the house and were replaced by another family, who moved on just as quickly. The house had become the centre of a serious outbreak of poltergeist phenomena. Unaccountable banging on the shutters, objects moving, groans and other strange noises alarmed the inhabitants to such an extent that nobody stayed for long. Many local people believed all this was connected with the murder. The story quickly spread, and it is said that people came from many miles around to view the house and, hopefully, witness the strange goings-on. John Baguley was never brought to trial, for he died shortly after making his deathbed confession. No relatives had reported the pedlar missing, but as an itinerant, his current whereabouts may not have been known. And as he was a Scotsman, he might not have had any family nearby. All in all, he was the perfect murder victim. There was never an investigation, and in any case, the murder was committed before the existence of a police force. But one mystery still remains, which I hope might one day be solved – what happened to the body of the pedlar? John Baguley himself claimed he buried it. But exactly where? The above is just a brief outline of what happened, but the book contains much more information and should be of interest for anyone interested in local history, or who just likes a true-life, mystery story. It is illustrated with photographs, sketches, old maps and reproductions of old documents. The Chilwell Ghost – A New Investigation is published by Arundel Books, price £5.99. Available at WH Smith in Beeston and most Nottingham bookshops.